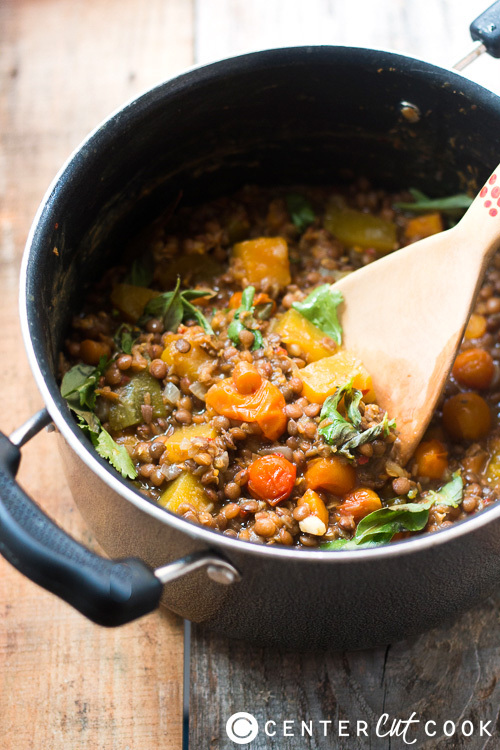 This one-pot lentil pumpkin stew is a delicious, healthy and easy dinner option for those days when you just want to throw ingredients into a pot and forget about them. We love lentils for dinner. They are easy to store, affordable, so versatile, gluten-free (if you are careful) and considered somewhat of a power food. They make for such an easy dinner option on most weeknights that we have them at least 2-3 times a week. We also love pumpkins and so we decided to combine the two in this lip-smackingly good one-pot lentil pumpkin stew. This stew has all the easy ingredients so that you just throw them into the pot and forget about them for a while. You can go read a book or watch TV or whatever it is you do while these hum away in a pot. I usually soak the dry lentils in water when I start prepping for the recipe. This helps them cook faster and saves me some time. While this recipe is vegan, we also like to top our bowls with some creamy greek yogurt for an added dose of protein. Feel free to explore add-ons such as mushrooms, spinach, potatoes to make this stew more wholesome and chock-block full of flavour. In a heavy bottomed pot, heat olive oil and add the bay leaf. Stir for a few seconds till the bayleaf releases flavour. Add minced garlic, onions, celery and carrots. Sauté for 7-8 minutes till the onions and celery look translucent. Drain lentils (if soaked) and add to the pot. Add chili flakes, salt, pepper and two and a half cups of broth. Cover and simmer for 30-35 minutes until the lentils are almost cooked through. Add the pumpkin, tomatoes and remaining broth to the pot. Once again, cover and simmer for 20-25 minutes. Check mid-way and add more broth if necessary. Once the pumpkin is cooked, check for seasoning and stir in basil and cilantro. 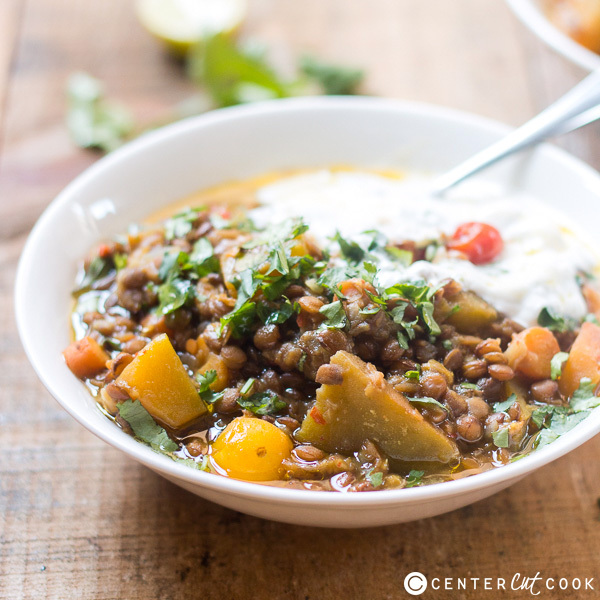 Ladle into bowls, and serve topped with some greek yogurt, chopped cilantro and drizzled with olive oil. While lentils need no pre-soaking, soaking helps speed up the cooking time. The timings in this recipe are calculated for lentils which haven’t been soaked. The cooking time can vary slightly depending on how old your lentils are.